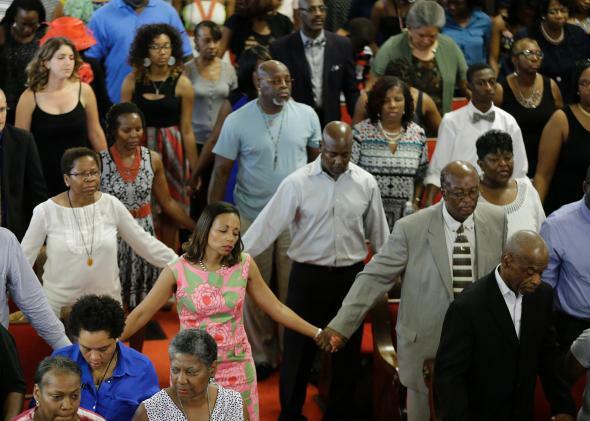 Parishioners embrace as they attend the first church service four days after a mass shooting that claimed the lives of nine people at the historic Emanuel African Methodist Church on June 21, 2015 in Charleston, South Carolina. 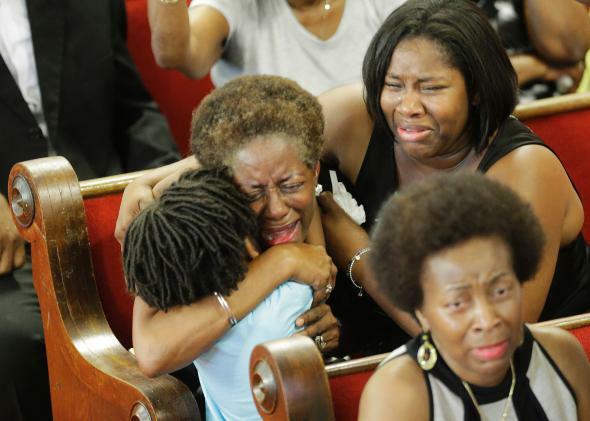 Parishioners embrace as they attend the first church service four days after a mass shooting that claimed the lives of nine people at the historic Emanuel African Methodist Church June 21, 2015 in Charleston, South Carolina. Hundreds lined up from the early hours of Sunday in the Charleston heat to participate in the service as police officers lined the stairs and checked everyone’s bags. There were so many people that some took a seat in the basement room where the shooting took place and others stayed outside listening to the service through speakers. Gov. Nikki Haley, U.S. Sen. Tim Scott, North Charleston Mayor Keith Summey, Charleston Mayor Joe Riley, and California Congresswoman Maxine Waters were some of the notable names who occupied the first pew, reports the Post and Courier. 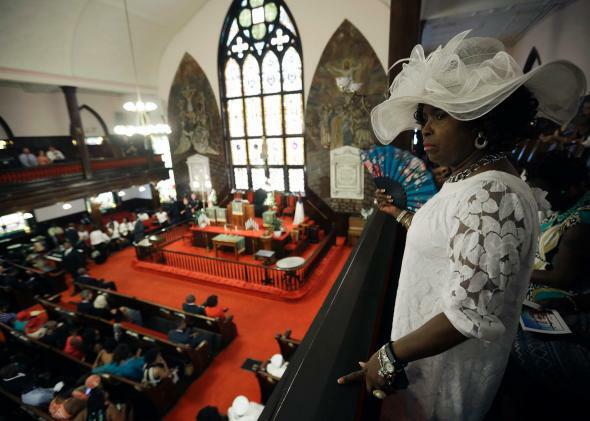 Gloria Moore watches the church as parishioners take their seats at the Emanuel A.M.E. Church four days after a mass shooting that claimed the lives of it’s pastor and eight others at the historic Emanuel African Methodist Church June 21, 2015 in Charleston, South Carolina. Goff led the service after the church’s pastor, the Rev. and state Sen. Clementa Pinckney was one of the nine people gunned down. Pinckney’s absence was evident and his seat at the pulpit was covered with a black cloth, notes the Washington Post. “It has been tough, it’s been rough, some of us have been downright angry, but through it all God has sustained us and has encouraged us. Let us not grow weary in well-doing,” said Goff. The Rev. 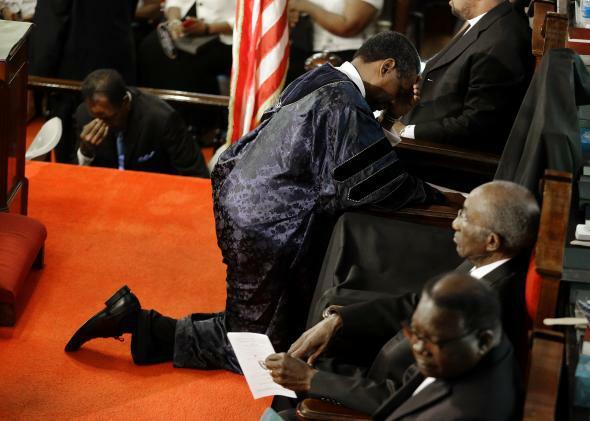 Norvel Goff, right, prays at the empty seat of the Rev. Clementa Pinckney at the Emanuel A.M.E. Church four days after a mass shooting that claimed the lives of Pinckney and eight others at the historic Emanuel African Methodist Church June 21, 2015 in Charleston, South Carolina. Outside the church was filled with balloons and flowers honoring the victims as well as posters calling on politicians to remove the Confederate flag from outside the statehouse, reports ABC News.